Multi Yums! was developed with your family in mind. To meet the challenges of your growing children’s nutrition, we provide you with fun, animal shaped, naturally flavored, chewable tablets. The assorted flavors (natural strawberry and natural cherry), will please everyone in the family. What you get are 19 vitamins and minerals, and much more.Click on the supplement facts tab on this page to feast your eyes on all that Multi Yums! has to offer. Vitamins include A, C, D3, E, B6, B12, Thiamin, Riboflavin, Niacin, Folate, Biotin, and Pantothenic Acid. Besides vitamins and minerals, we have included Organic Barley Grass, Broccoli, Carrot, Papaya, and Spinach Leaf Powder; a Citrus Bioflavonoid Complex, Inositol, Non-GMO lecithin, Marigold flower extract, and PABA. You could try to prepare meals with the necessary fruits and vegetables but would your children eat the required amounts to equal a daily serving of Multi Yums! 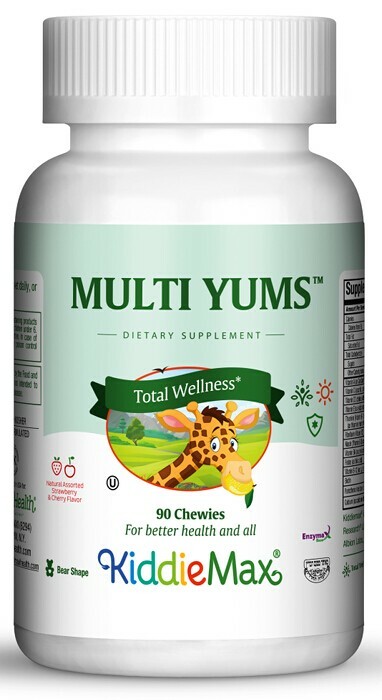 Now it’s easy to get your children to take their vitamins, with Multi Yums!. Chew one (2) tablet daily, or as directed. Other Ingredients: Sucrose, stearic acid, dicalcium phosphate, maltodextrin (from corn), magnesium stearate, cornstarch, sucralose, Enzymax® (calcium carbonate, bromelain, papain, lipase, amylase, protease, silica). This product contains no wheat, gluten, yeast, salt, milk, artificial flavors, colorings or preservatives. TRAACS® is a registered trademak of Albion Labs, Inc.